On Mother’s day, and my brother’s birthday, I decided to take amma and dad for dinner at my brother’s favorite restaurant in town, Kailash Parbat. Unfortunately though, after reaching Jubilee Hills, we realized that the place has been closed for a while. We then decided to finally give A’la Liberty a try. We reached there about 9:00 PM, and were surprised to find the restaurant totally packed, with an approximate waiting time of 90 minutes. Given that we were all hungry, we finally moved to Bikanervala, which had a minimal waiting time. We decided to sit upstairs at the restaurant, which has better ambiance and is less crowded than the snack section downstairs. After waiting for about 10 minutes, we were seated at a table for five, right next to the buffet spread. Though we had initially planned on going for à la carte, I was tempted by the wide spread, so I alone opted for the buffet. Amma and dad ordered a Nargisi Kofta along with Masala Kulcha and Methi Paratha. The food was served in about 10-15 minutes. The Nargisi Kofta looked really good, and tasted yum. 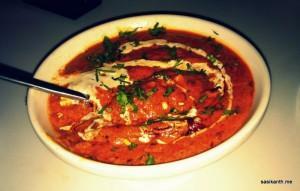 The kofta ball was soft, full of paneer and nuts, while the gravy was thick and rich, with a nice spicy flavor to it. The Methi Paratha was alright while the Masala Kulcha was very good, with tons of butter on it. These guys also ordered an Aloo Paratha later on, and apparently, this wasn’t that good compared to the Kulcha. Talking about the buffet which I hogged on, on this Sunday evening, they were serving Tomato Shorba and Sweet Corn Soup, along with Paneer Tikka, Baby Corn Honey Chilli (or something of that sort), and Veg Tikki/Kebab as starters. 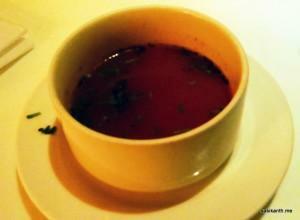 I opted for the shorba, and was immediately served the soup along with the starters. The shorba was thin and didn’t taste great. I’ve had better Tomato Shorbas in my life. 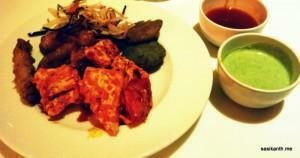 Of the starters, the paneer was very fresh and tasted good, while the baby corn needed more spice to be flavorful. The kebabs were just alright. 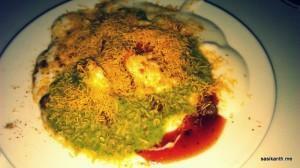 I also had some Dahi Papdi before indulging in the main course, which was pretty good. Apart from the regular make you own salads and Indian snacks (such as fryums, papad and Dhokla), for main course, they had Lahori Paneer, Paneer Korma, Bharwa Mushroom, Chiya Kofta, Veg. Jalfrezi, Kadi Pakoda, and their special Punjabi Chole on the Indian front (apart from Dal and Dal Makhni). 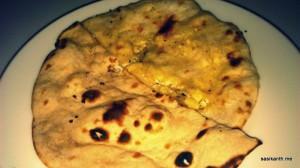 There were different variety of breads to choose from, and I had a Tandoori Roti and Paneer Kulcha. Except for the mushroom and Chole, all other curries were just alright and forgettable. The Paneer Korma (white gravy) was infact very bland. The mushroom on the other hand was amazingly good. They were stuffed with paneer and other spices, and cooked just perfect. I would have preferred them to be less greasy, but maybe it was the ghee which made them taste so good. The Chole was authentic and yum. 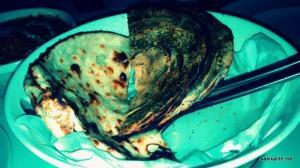 Of the breads, the Paneer Kulcha was very good, while the Tandoori Roti was decent. I had a small serving of the Dum Biryani, which like in any other buffets, tasted terrible. 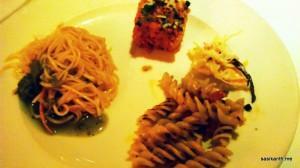 On International front, they served Pasta Oliva, Chow Mein and Mixed Vegetables in Coriander Sauce. I The pasta was very dry, and again, was just decent. The Noodles were pretty good, but the accompanying oriental gravy wasn’t upto the mark. 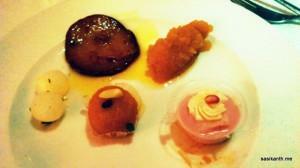 Not being entirely satisfied with the buffet till this point, I divulged into their desserts. They had Moong Dal Halwa, Malpua, Motichur Laddu, a couple of Bengali sweets, fresh fruits and three flavours of ice creams. The Malpua and Moong Dal Halwa were very palatable, and the Laddu too was very good, while the Bengali sweets could have been better. The ice creams were alright. I was actually hoping for more on the dessert front, and was not entirely satisfied. It would have been nice if they had more variety. Overall, I actually regret not going for the à la carte along with amma and dad, for I really didn’t enjoy the buffet so much. 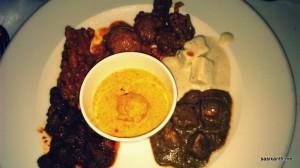 Except for a couple of Indian curries and desserts, the rest of the items were plain average. For 600 bucks, I expect much more than average. The à la carte dish tasted way better than any curry on the buffet (I know this is expected, but still). I honestly don’t think I’ll ever be coming back for the buffet, especially when there are tons of other places which offer such average dishes with much more variety for lesser price. Give it a try for their à la carte, or their snacks, and that’s about it.